It was time to break the routine. 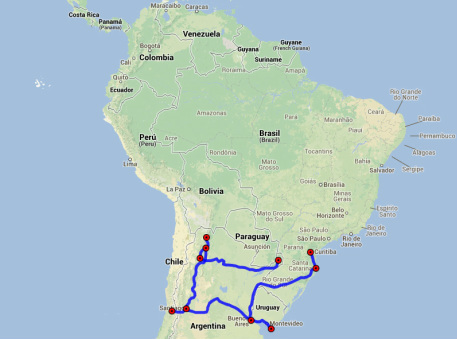 Upon returning to Buenos Aires, I excitedly prepared for a three week trip around northern Argentina. Vita was also excited; she had been working hard until now, and her Taiwanese passport possessed a number of travel restrictions so she had been unable to join me in Uruguay. We chose to explore the north of Argentina, as winter was near and three weeks just didn't seem to be enough time to explore the south as well without flying, which I refused to do during any of my travelling in South America. I had already visited Terra Del Fuego a few years before anyways. We hopped on a bus out of Buenos Aires and headed west to Mendoza. After a lengthy twenty hour bus ride, we arrived in Mendoza on May 25th, a national holiday celebrating the May Revolution. The May Revolution was a series of events in Buenos Aires from May 18 to 25, 1810, that marked the beginning of the Argentinian War of Independence. To celebrate this day, many of the fountains in Mendoza were running with blue-coloured water. Greater Mendoza has a population of just over one million people, making it the fourth largest metropolitan area in Argentina. Mendoza is known for its wines; the surrounding area is the largest wine producing area in Latin America. It is also known for its hiking, horseback riding, and rafting. We arrived at the Hostel International, a colourful place with a nice bar and a pool table, and promptly explored the city. The city was clean and as it was a sunny day in late autumn, Mendoza had a crisp refreshing feel to it. There were numerous leaves scattered along the ground. We checked out the beautiful San Martin Park in the west of the city, named after Jose de San Martin, an Argentinian general who was the leader of southern South America's struggle for independence from the Spanish Empire in the early 1800s (Simon Bolivar was the leader in the north). He is a national hero of Argentina, and there is a statue or street named after him in most of the cities in the country. San Martin Park greeted us with a myriad of fall colours as well as a peaceful and placid lake, as well as the stunning Fuentes do los Continentes (Continents Fountain). The fountain is about 100 years old, original sculptor unknown. The next day, we went horseback riding. I was very excited to do this as I had grown up with horses, but sadly had not taken the opportunity to ride them often enough during my early years. It is something I enjoy greatly now. We started the ride in the late afternoon at a ranch just outside of the city, riding with a group of a dozen people or so for about two hours as the sun set over the horizon. My horse, Miguel, was a bit advanced in age and didn't like to do any more than he had to, but I did manage to coax him into a brief gallop towards the end. After the ride, the owners of the ranch cooked up a magnificent asado and served us plenty of Malbec red wine (which I henceforth discovered to be my favourite red wine). The meat at this asado was sublime. This was our first truly great day of the trip around Argentina. We followed this up the next day with a high Andes bus tour. I am not usually a fan of tours, but this one sounded good with promises of spectacular views of the Andes Mountains. Alas, it was not to be. The bus broke down in the mountains, resulting in a cold wait while the tour company brought another bus up. I am not sure where the new bus was coming from, but it must have been far as we waited about two hours. To top it off, heavy snows set in and so we were unable to go any farther in the new bus. Oh well, it happens. Fortunately, it had not snowed in Mendoza itself. We decided to go on a bike tour of several of the wineries surrounding the city the following day. The bikes were in bad shape, but we didn't care as we were constantly distracted by the beautiful scenery. We visited three wineries, and I used the opportunity to affirm that yes indeed, Malbec was my new favourite red wine. I bought a couple of bottles of Malbec that did not survive the evening as a result of another asado at our hostel that night. We stayed up late, playing pool with a Dutch guy named Pim until the wee hours of the morning. Vita and I also had a good time chatting with some people from Ecuador that we met at the hostel. Despite drinking far more Malbec wine than was good for me, I felt pretty good the next morning, with virtually no headache. We took it easy the next day and went for a run around San Martin Park, followed by dinner at El Mirador restaurant in the evening. This restaurant boasts a view of Mendoza in every direction, and we were the only customers there during our entire meal. Mendoza was a real treat. It was smaller and calmer than Buenos Aires, and the presence of the mountains opened up a variety of different outdoor activities. The climate was perfect and the people were friendly. If I were to live in a city in Argentina, I would choose Mendoza. It was now time to go north. The fountains of Mendoza were running blue on May 25th, 2013. We were treated to many beautiful colours on this sunny late autumn day in Mendoza. Hanging out by the lake at San Martin Park. Fuentes de los Continentes (Continents Fountain) in San Martin Park, original sculptor unknown. Riding horses as the sun sets over a slanted horizon. Our wine bike tour. Fortunately, there was a van behind us transporting the wine that we bought. Our third winery for the day. Cheers! Night view over Mendoza from El Mirador restaurant. Another lengthy bus ride later, Vita and I arrived in Salta. We were a little disorientated as we left the bus station, but fortunately our next hostel, 7 Duendes, was close to the station. Salta has a metropolitan population of 620,000 people and is known for its preservation of colonial architecture. It is nicknamed Salta la Linda (Salta the Beautiful). It is an old city, founded in 1582, and was originally intended to act as an outpost between Lima in Peru, and Buenos Aires. We stayed in the city for a couple of days and wandered around. From my point of view, there was much to do unless one had a special interest in old buildings (I like them, but have no special interest). I did enjoy climbing the trail up San Bernardo Hill in the east of the city. We were able to take in some impressive views from the top (which one can also reach by gondola). There was an outdoor gym at the summit. After a few days in Salta, Vita and I decided that renting a car for two days would be the best way to see some of the areas around the city. I generally hate shopping around for the best price, but Vita was very good at it, and she eventually found a car rental company with a good price (we found out right after we paid our money that the car rental company was owned by a friend of Pim's, which annoyed Vita somewhat as she was confident that she could have knocked the price down a little bit more). The next day, we drove north from Salta. Driving in Argentina was quite exciting. While there were plenty of four-way intersections in the city, there were no stop-signs, so people tended to just slow down at these intersections and sometimes honk their horns to declare their presence to any incoming cars that might be potentially driving across their path from around a blind corner. It was a bit stressful, but the system actually worked really well, and while I would describe the overall driving style as aggressive, it was controlled aggression, and I did not witness any road-rage. As we drove north to Purmamarca, the roads emptied and there were only a few cars. We saw a couple of people near a broken-down car and so we offered to drive them somewhere (turns out they did not own the car, and were only looking for a way north). They were a nice couple from Belgium making their way around Argentina by hitch-hiking and working at organic farms throughout the country. We dropped them off at the next big city, San Salvador de Jujuy, and after I got lost for nearly an hour in the new city, we finally made our way up to the town of Purmamarca. Purmamarca is a tiny town of about 2,000 people and its name is derived from the language of the Aymara people of the Andes. In the Aymara language "purma" means desert and "marca" means city. Purmamarca's main attraction is Ciero de los Siete Colores (Mountain of Seven Colours), which not too surprisingly is the main reason we went there. The colours of the mountain are a result of numerous diverse geological processes involving marine sediments as well as lake and river movements. We had to hike to get a better vantage point, but it was well worth it. Later that day, we kept driving north and arrived in yet another tiny picturesque town of about 5,000 people named Tilcara. We decided to stay in Tilcara for the night. We found a fantastic little restaurant near the hostel managed by a delightful lady who had put every effort imaginable into decorating her venue. I tried the locro, a thick stew that is common along the Andes Mountains. It was good. We got up early the following morning and prepared ourselves for what turned out to be the second great day of the trip. We drove to the Salinas Grandes salt desert (a salt desert is the remnant of a body of water that allows no outflow to external bodies of water) early in the morning to avoid meeting too many other people, and were rewarded by being practically the only people there. We were able to take the car out onto the desert. It was pretty cool to experience this somewhat alien-looking landscape (and yes it tasted salty). That evening, we returned to Tilcara and hiked to the top of a mountain overlooking the city. I tried to run it all the way, but got winded half-way up (I am not sure whether that was from me not doing that much exercise for the last few weeks or an increase in altitude, probably both). At any rate, Vita and I took in some great views from the top. We returned to the same little restaurant that evening. During our dinner, Tilcara experienced a complete power outage for about 40 minutes. Our hostess explained that this was a regular occurrence. It didn't bother us at all, and with the addition of a couple of candles the silent darkness only added to the ambiance of our dinner. After returning to Salta the next day and returning our car, we took it easy. We stayed at a different hostel this time which was not quite as good as 7 Duendes had been; it was a small matter, as we were only there one night. Although Salta was nice, the real gems in this area of Argentina were the smaller towns up north, namely Purmamarca and Tilcara, and the surrounding natural geological formations. If given the option, I would certainly return to see these again. We were now ready to go south and hopped on a bus to the town of El Cafayate. There was a place just outside the town that I had been itching to see for a couple of years now - La Estancia de Cafayate. Here is our view from the top of San Bernardo Hill, gondola in the foreground. This horse decided to really take his time while crossing the road as we drove from Salta up to Purmamarca. Vita tries to kiss one of the llamas. They are a bit taken aback. They are taking their revenge out on me. Ciero de los Siete Colores (Mountain of Seven Colours) faces the tiny town of Purmamarca; the colours result from numerous and diverse geological processes. Another view of Ciero de los Siete Colores, from a different angle. Salinas Grandes salt desert. Nothing but salt and sky. Vita posing with our car on the salt desert. From the top of this mountain, beautiful views could be seen of Tilcara. From the top one can also see the Purcara de Tilcara ruins. The bus ride to the town of El Cafayate was scenic. Winding our way through colourful mountain passes and interesting geological formations, I was eager with anticipation. We arrived at El Cafayate in the middle of the day. The town of El Cafayate has 12,000 inhabitants and is widely acknowledged for the quality of the wines grown in the area. The town itself is very quiet and peaceful, and the people extremely friendly. We were guided towards our hostel, El Balcon (named for its balcony), and arrived to find that we were the only ones there. We puttered around El Cafayate the rest of the day. It is the only place I know of where one can try "wine" ice-cream. I tried the Cabernet and Vita had the Torrontes. I cannot say that I was overly impressed with it, but Vita thought that her Torrontes was delicious. The following day, we explored a few wineries around town. What I was really interested in seeing, however, was La Estancia de Cafayate, located two kilometers outside of town. La Estancia de Cafayate is a self-sufficient community. The people there live in relatively undisturbed isolation from the rest of the world. Many of the residents there are from overseas - largely North America - but many are also from Argentina. I had wanted to go there for some time after reading about it in an article by Doug Casey, a libertarian economist originally from the US, who founded the place. I was pestered by the security guard at the front gate, who asked us to take a cab into La Estancia, and stated that it was for our own safety, although there were virtually no cars on the road. He also gave me a bright orange jacket to wear in case we walked around a bit (I carried it, but there was no way I was ever going to wear it). Fine and done. We took a cab from the front gate, and we were in. Entering La Estancia was like entering a different world. It was quiet...no it was more than that, it was serene. I sensed that time moved slower here. Only a couple of cars passed us as we walked around. There were vineyards, trees, and mountains everywhere, and only a few scattered homes. As we enjoyed a cup of coffee at a quiet restaurant overlooking the mountains, Vita stated commented on the absolute tranquility of the place by stating that it would be the perfect place to escape the world, including one´s final days. I agreed with her that perhaps spending a few months a year in La Estancia would be ideal, although I was not interested in considering where to spend my final days quite yet. The next day, we decided to treat ourselves and have lunch at the organic winery in town. This was a wise move, as it proved to be probably the best meal of our trip. There were a few reasons for this. First, the food was fantastic. Second, the wine was top notch (I tried the Tannat this time). Third, our waiter was inspiring in his attention to detail and his demeanour. For him, everything had to be perfect and he obviously was striving to be the best he could be at his job. I always love to watch people who have passion for whatever they do, and he had it. The town of El Cafayate was nice. La Estancia, however, was unlike anything I had seen before. It would be a top choice as a place to live. It was time to go east, to Iguazu Falls. The entrance to La Estancia de Cafayate. La Estancia de Cafayate is characterized by mountains, vineyards, and serenity. Having a coffee at La Estancia de Cafayate. If you ever want to escape the world, this is a good place for it. Yet another view of La Estancia de Cafayate. The incarnation of stillness. Time to return to reality. A superb meal in the organic winery in the town of El Cafayate. The waiter behind me was inspiring in his attention to detail. The bus ride to Puerto Iguazu was a long one. We stopped in San Miguel de Tucuman for one night. I cannot comment about this city much as we only transited through, staying long enough to have dinner, walk around the city by night, sleep in another hostel, and grab another bus in the morning to Puerto Iguazu. Puerto Iguazu was certainly not among the more impressive cities that I have visited. It contains 82,000 people and is clearly geared towards tourism. Vita and I spent an entire day at Iguazu Falls. We could not have asked for more beautiful weather in what became our third and final best day of the trip. The word "Iguazu" derives from Guarani or Tupi language and more or less translates to "big water." The falls where the Iguazu River drops over the edge of the Paran Plateau, and it actually consists of many smaller waterfalls that number from 150 to 300, depending upon the water level at the time. The falls are shared by Argentina and Brazil. The Argentina side is much larger by area and was often rated more highly by the people that I spoke to. We explored Iguazu Falls as much as we possibly could. We first observed the waterfalls from below using a variety of constructed walkways. Next, we took a boat to San Martin Island, providing for probably what were the most spectacular views of the San Martin Falls. Following this, we took another boat that toured the base of the falls. It almost took us right under, and I felt like I was underneath a giant shower. Unfortunately, it also made it nearly impossible to get a close-up photo. Finally, we took the upper walkways to Gargantua Del Diablo (the Devil's Throat), by far the largest waterfall at Iguazu Falls. Gargantua Del Diablo receives about half of the flow of the Iguazu River. There is so much mist that you cannot see the bottom of it. It is quite impressive. There was an abundance of wildlife at Iguazu Falls. My favourite creatures were the many butterflies that hovered around the waterfalls. Several of these landed on us. One in particular stayed on my arm for about an hour as we made out across the walkways to Gargantua Del Diablo. There were also large numbers of mischievious coatis (members of the raccoon family) hovering around the eating areas, just waiting for somebody to take their eyes off of their food for a few seconds. I recall one lady screaming and running after one of them as they ran away with her lunch. Iguazu Falls is one of those rare spectacles that is worth almost any amount of effort to go to. Words and photos can only describe them so much. If you ever get the chance to go there, you probably should. After a full day at Iguazu Falls, Vita and I returned to Puerto Iguazu for a bit of relaxation and a nice dinner. Sadly, we were soon to part ways. Vita had a plane to catch back in Buenos Aires so to see some friends in Ecuador, and I needed to push on into the middle of the continent. The following day, we had a lazy morning in one of the parks in Puerto Iguazu, followed by some fish soup for lunch and a slow meander back to the bus station. After Vita boarded her bus back to Buenos Aires I had about an hour to kill in the Iguazu bus station while I waited for my own bus to Paraguay. I sat on a bench and let my mind wander for a while as the buses entered and exited the station. I thought about my initial goals at the start of my travels, how I had desired to be free from both material possessions and daily routine. I had wanted to be off the grid and not easily "contactable" for a period of time. Thus far, I felt that I had achieved these things. I also thought about fortune versus fate. I shall always consider myself extremely fortunate to have met somebody like Vita with whom I could share so many experiences in so short a period of time. ​My musings were interrupted as my bus rolled up. Stepping on, I was on my way to Paraguay. The Iguazu Falls, one of the seven wonders of nature, actually consist of a number of waterfalls, such as the San Martin Falls pictured here (view from San Martin Island). Vita in front of Iguazu Falls (view from San Martin Island). There are many boat tours along the waterfalls, and they will take you pretty close. You will also get really, really wet (view from the lower walkways). In front of Iguazu Falls (view from the lower walkways). There were butterflies everywhere, and they would often land on top of us to hitch a ride (view from the lower walkways). Final photo with Vita (view from San Martin Island). Gargantua del Diablo (the Devil's Throat) receives about half of the flow of the Iguazu River. It is impressive (view from the upper walkways). As I boarded the next bus, I was uncertain as to what awaited me in the middle of the continent. Perhaps I would be on my own from this point on, but perhaps not. I would wait and see.